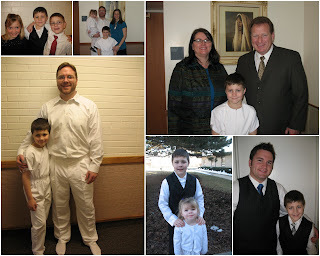 Jake's baptism was great! We had lots of family and friends come for the special event. The talks were fantastic and the spirit was strong! 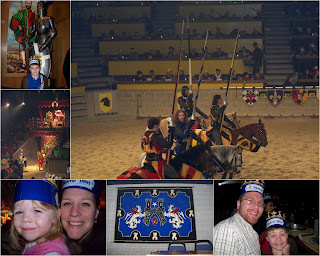 Medieval Times was AWESOME! The kids were mesmerized with the horses and sword fighting. They gave us crowns when we walked in the door that signified what color knight we should cheer for. We were cheering on the blue knight. The food was pretty good and way more then we could eat. I would definitely go again! 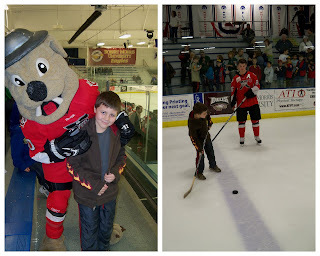 Jake and Jay were able to go to a Chicago Steel hockey game with the Scouts. The Steel won against the Ice by one point. Jake's scout ticket included a hot dog, a drink, a patch and three shots on the ice with the team after the game. They had a great time! Today is Jake's 8th birthday! We celebrated his birthday yesterday by having a party with his friends. We had a castle/knight theme and six boys came to sword fight and prove themselves worthy of the rank of knight. Jay organized and ran the activities and I made the cake, took pictures and played with Olivia. Olivia was excited about the party and can't wait until it's her turn for a birthday! Overall, it was a fun time and Jake loved hanging out with his friends! Jake is a sweet boy who loves being active and creative. We love him very much and wish him a very happy birthday! Jake and Jason didn't have school today so we decided to make the most of a snowy day and go snowshoeing. This is our first time and the kids thought it was pretty fun. Olivia only lasted about an hour but Jake and Jason kept going for a couple of hours. 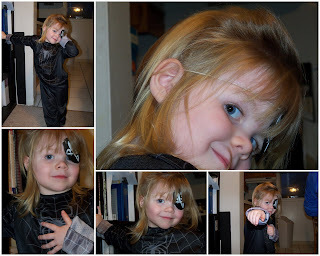 Olivia really wanted to put on this spider-man costume and then she started doing these poses... I had to take pictures! What a fun time! The kids loved seeing all the Disney characters playing and having fun. Jay and I also had fun and were surprised at how much we enjoyed ourselves! I would definitely do it again! 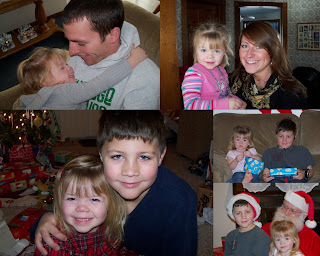 We were able to go back to Indiana and visit all the family for Christmas. We had a great time catching up on everyone's busy lives and just having fun with brothers, sisters, moms, dads, grandmas, grandpas and cousins. 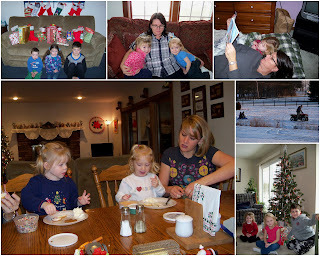 We baked cookies (to add to the mounds that grandma Gibson already made) and frosted them with the little girls and the boys played in the snow either sledding and snowboarding down the little hill behind grandma Gibson's house or being pulled on a sled behind the 4-wheeler. Aunt Leslie had a tea party with the girls and Uncles Adam and Joe played with the kids as much as they could. We all enjoyed good talks and lots of laughs with everyone. It really was a great time!